Learn valuable lessons from the newly successful private equity players in China and explore the challenges and opportunities offered in Chinese markets The first book to deal with private equity finance in China, Private Equity in China: Challenges and Opportunities provides much-needed guidance on an investment concept that has so far proved elusive in Asia. Focusing on the opportunities that the Chinese finance market offers to private equity firms, the book shows how these firms can strategically position themselves in order to maximize success in this new marketplace. Private Equity in China includes in-depth case studies illustrating both successful and failed ventures by private equity firms operating in China, outlining the challenges faced by private equity firms in setting up new funds. It contains a collection of valuable experience and insights about acquiring companies and turning them around essential for any firm currently operating in, or considering entering, the Chinese market. 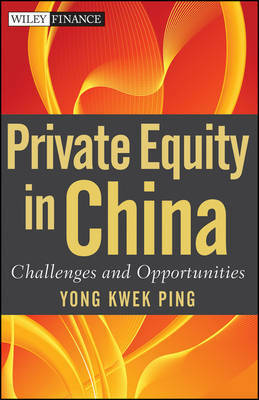 * Discusses the challenges faced by private equity firms in China including setting up the initial fund, fund raising, deal sourcing, deal execution, and monitoring and exit strategies * Provides key insights drawn from keen observations and knowledge of the more mature private equity market in Western countries, analyzing the way forward for the Chinese private equity industry * Discusses the role of renminbi-denominated funds in the development of the private equity industry in China Breaking new ground in exploring and explaining the private equity market in China, the book offers incredible new insight into how equity companies can thrive in the Chinese marketplace.